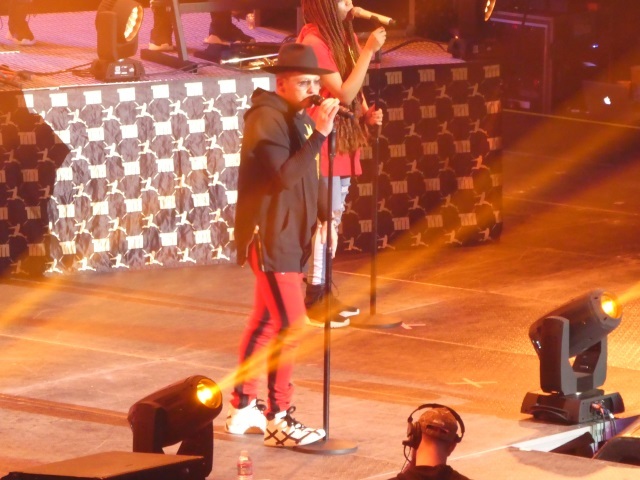 TobyMac perfectly blended mainstream style and melodies into modern praise music for his Hits Deep Tour 2018 that gave a well-attended Moda Center crowd on Saturday in Portland a bit of church but a full-fledged concert performance that thoroughly entertained. TobyMac’s catalogue offers a diverse collection of songs that dives deep into hip hop, of course rap, but with some backbone of rock and a body of pop. Call it a new genre: Hip Pop. (You heard it here first.) He’s definitely a showman with a solid stage presence often knocking on the doors of Imagine Dragons without the guitar-centric rock chords while peering over at Bruno Mars. He offered some fun choreography with the Diverse City Band, his backing musicians, but instead of checking out on the music to simply mesmerize the audience on synchronous dance moves, like it feels from others in this brand, TobyMac extended his range and a message to enrapture the 10,000 plus in attendance. 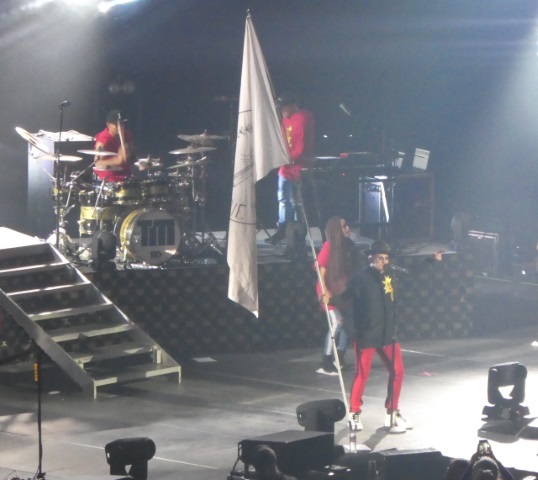 In full disclosure, attending TobyMac was more about testing a camera received for Christmas. You can probably tell from past posts some rather lacking photos and where my musical tastes rest. So, with Costco’s 90-day return policy approaching it was now or never. And further fully disclosing, I don’t care for hip hop and certainly not rap. Yet, after seeing TobyMac who never wholly-out raps or freestyles (he left the stage for a DJ Maj solo which, well…) but instead occasionally incorporates this spoken word form mid-song like on “Love Broke Thru” or “Lose My Soul” which honestly, works pretty good because it doesn’t suffocate. Surely, TobyMac would agree that God works in mysterious ways as this was one rocking show and totally worth seeing again. 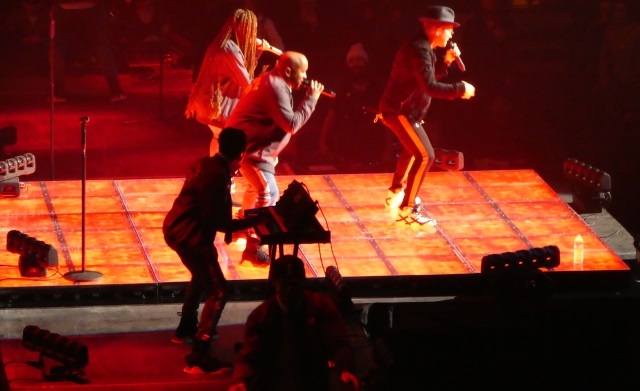 Indeed, TobyMac produced an eclectic fare of trend biting music that widely embraces his Christian faith while building the diverse bridges other candid Christian artists seemingly find unsuccessful. The co-founder of DC Talk, one of the more popular Christian bands from the 1990s which went on hiatus in 2000, offers hope, love and a thoroughly positive message (no F-bombs, N-words, mysogyny or hate fill-in-the-blank on this night) channeled around the latest grooves and beats that cross generations and a medley of music fans. Seriously, it’s not like Portland represents a mecca for Christianity nor the Pacific Northwest, for that matter, where TobyMac visited four arenas in less than a week. Truly, TobyMac falls inside the same pea pod as Justin Timberlake whose brand certainly offers similar pleasing rhythms and harmonies while building an immense and diverse fan base. Arguably, both crossed the gap, from opposite sides, between the secular and religious off the same style, looks and hooks. But with TobyMac at 53 and his contemporary a wee 37 it raises the question of who came first. Justin Timberlake or TobyMac? By the way. The camera? Well it did not fully impress however it achieved far better results than a cell phone camera and provided better resolution than a much older model. You be the judge.